36" gold, wire sparklers are the longest sparklers available! 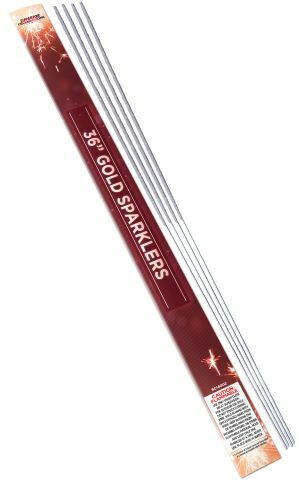 These extra large sparklers burn for well over 3 minutes with a near-smokeless gold sparkle. They're popular as wedding exit sparklers, or for 4th of July celebrations. They come in a pack of 10 sleeves with 4 sparklers each, for a total of 40 sparklers. Awesome and a good deal. Received our sparklers in less than 24 hours. Great sparklers! Lasted a long time!! Perfect ending to a beautiful day!! Perfect ending to a beautiful day!! They were perfect for our bride and groom's exit. They burn for a long time! We used this for a picture at the end of the night for our wedding and they were perfect! They were delivered super fast, in great condition, and the packaging was perfect. Can't stress enough how beautiful these sparklers are! I would definitely recommend this company and this product! I would definitely recommend this company and this product! Ordered these for my daughters wedding in May. They were very quick to ship and be delivered!! The sparklers look great! Can't wait to use them!!!!! Worked out great for our wedding! Arrived quickly and was exactly what we wanted for our wedding. Tested one and it burned very well. Great prices and delivery time! They light quickly and burn nicely! They light quickly and burn nicely! They light quickly and burn nicely! Long burn time - perfect for night photos! Long burn time - perfect for night photos! Sparkled a long time! Sparkled a long time! The sparklers lit easily and lasted a long time! Sparkles were easy to light & lasted a long time. Made for great pictures. We used these for our wedding send off. They were perfect! They lasted a long time, and having a longer length to the stick itself helped people not be nervous about getting burned. The pics came out great!!! The delivery was fast and everything came in great shape.